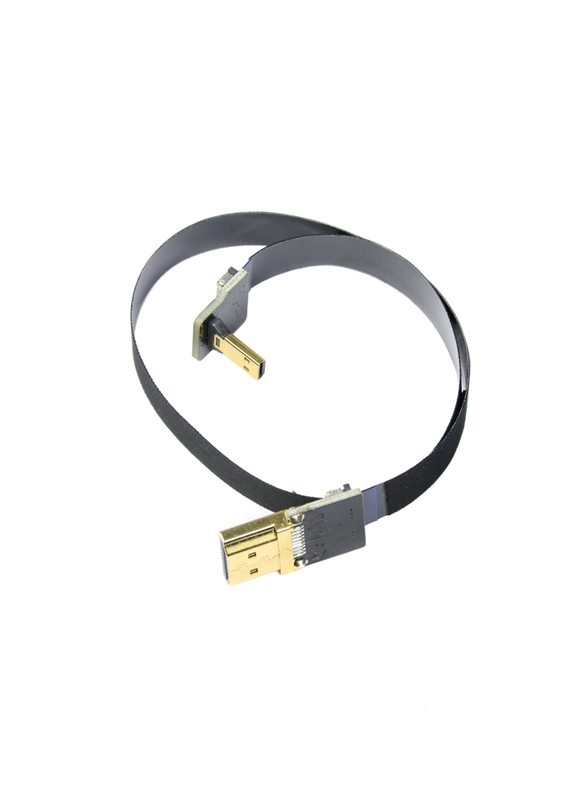 Our super thin HDMI ribbon cable is designed for lightweight and limited space applications, such as on drone gimbals. The cable is flexible so it ensures minimum strain on the gimbal movement, while the connectors have a small footprint. The cable can be used to connect cameras that have a HDMI output to HD display monitors. It can also be used with HDMI to AV video converters and HDMI wireless transmitters such as the DJI lightbridge. Micro HDMI (Type D) Right Angle to Standard HDMI (Type A) Straight Adapter Cable: The cable is suited to cameras such as the Panasonic GH4 and Blackmagic Pocket Cinema camera with Micro HDMI output. Mini HDMI (Type C) Right Angle to Standard HDMI (Type A) Straight Adapter Cable: Suited to cameras such as the Sony Nex 5 / 7 and others with a Mini HDMI output.